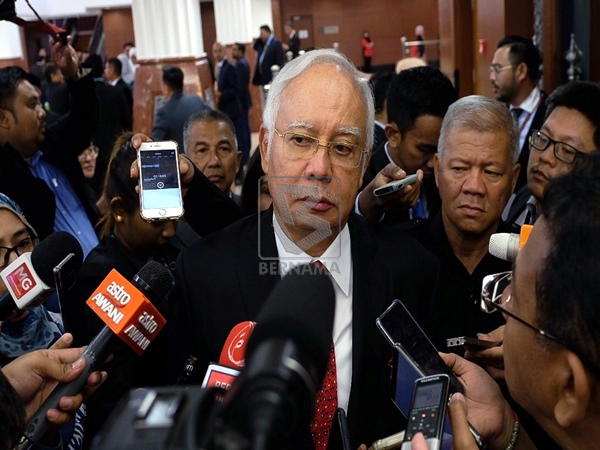 KUALA LUMPUR: Former prime minister Datuk Seri Najib Tun Razak is to be charged today in the Sessions Court on three counts of money laundering in relation to funds belonging to SRC International Sdn Bhd, it was reliably learned. It was also learned that the charges against Najib, 65, are likely to be framed under Section 4(1) of the Anti-Money Laundering, Anti-Terrorism Financing and Proceeds of Unlawful Activities Act 2001 (AMLATFPUAA). If so, they carry a maximum jail term of 15 years and fine of not less than five times the proceeds of the unlawful activities, if convicted. It is understood that the case will be heard before Sessions Court Judge Azura Alwi. The court has placed barricades and set up a registration counter for the media to facilitate coverage of the proceedings. Reporters from the local and international media have been camping outside the court complex from as early as 6.30 am. A total of 21 pink passes were provided for the reporters allowed into the court while 50 yellow passes were distributed to reporters, photographers and cameramen to be stationed outside the courtroom and in the lobby of the complex. A check revealed that two rows of seats in the Sessions Court have been made available for the media and one row each for the accused’s family and Malaysian Anti-Corruption Commission (MACC) personnel. On July 4, Najib pleaded not guilty at the High Court to three charges of criminal breach of trust (CBT) and one count of abuse of power over funds totalling RM42 million belonging to SRC International Sdn Bhd.